The Special Counsel investigation was a United States law enforcement and counterintelligence investigation of the Russian government's efforts to interfere in United States politics and any possible involvement by members of the 2016 Trump presidential campaign. It was primarily focused on the 2016 presidential election. Through January 2019, the Special Counsel has publicly initiated criminal proceedings against 34 people—seven U.S. nationals, 26 Russian nationals, and one Dutch national—and three Russian organizations. The Special Counsel has brought charges in three different jurisdictions: the District of Columbia (D.D.C. ), the Eastern District of Virginia (E.D. Va.), and the Southern District of New York (S.D.N.Y.). The Special Counsel has also referred several cases to other prosecutors, resulting in charges against two individuals. The charges have resulted in some convictions, several plea deals, and jail time in several cases. Details are summarized below. 2.6 Internet Research Agency, et al. 2.8 Viktor Netyksho, et al. October 3, 2017 1 count: false statements Pleaded guilty on October 5, 2017. Sentenced to 14 days in prison, a $9,500 fine, 200 hours of community service and 12 months probation on September 7, 2018. Released from prison on December 7, 2018, after serving 12 days of the 14-day sentence. D.D.C. October 27, 2017[A] 2 counts: conspiracy against the United States and false statements Pleaded guilty on February 23, 2018. D.D.C. February 22, 2018 23 counts: assisting in the preparation of false tax returns (×5), subscribing to false tax returns (×5), filing a false amended return, failure to report foreign bank and financial accounts (×3), bank fraud conspiracy (×5), and bank fraud (×4) Charges dismissed without prejudice on February 27, 2018. E.D. Va.
October 27, 2017[B] 2 counts: conspiracy against the United States and conspiracy to obstruct justice Pleaded guilty on September 14, 2018. Sentenced to 73 months in prison on March 13, 2019. [C] D.D.C. February 22, 2018 18 counts: filing false tax returns (×5), failure to report foreign bank and financial accounts (×4), bank fraud conspiracy (×5), and bank fraud (×4) Found guilty on 8 counts, mistrial declared on 10 counts on August 21, 2018. Sentenced to 47 months in prison on March 7, 2019. [D] E.D. Va.
November 30, 2017 1 count: false statements Pleaded guilty on December 1, 2017. D.D.C. February 7, 2018 1 count: identity fraud Pleaded guilty on February 12, 2018. Sentenced to six months in prison, followed by six months of home confinement on October 10, 2018. D.D.C. February 16, 2018 1 count: false statements Pleaded guilty on February 16, 2018. Sentenced to 30 days in prison and a $20,000 fine on April 3, 2018. Released from prison on June 4; deported to the Netherlands on June 5, 2018. D.D.C. 8 counts: conspiracy to defraud the United States, conspiracy to commit wire fraud and bank fraud, and aggravated identity theft (×6) Outside U.S. jurisdiction D.D.C. 1 count: conspiracy to defraud the United States Pleaded not guilty on May 9, 2018. June 8, 2018 2 counts: obstruction of justice and conspiracy to obstruct justice Outside U.S. jurisdiction D.D.C. July 13, 2018 10 counts: conspiracy to commit an offense against the United States, aggravated identity theft (×8), and conspiracy to launder money D.D.C. November 29, 2018 1 count: false statements Pleaded guilty on November 29, 2018. Sentenced to 2 months in prison on December 12, 2018. [E] S.D.N.Y. January 24, 2019 7 counts: obstruction of proceeding, false statements (×5), witness tampering Pleaded not guilty on January 29, 2019. Trial scheduled for November 5, 2019. D.D.C. ^ An 8-count indictment issued on October 27, 2017, was superseded by the current information on February 23, 2018. ^ A 9-count indictment issued on October 27, 2017, a 5-count indictment issued on February 23, 2018, and a 7-count indictment issued on June 8, 2018, were superseded by the current information on September 14, 2018. ^ 30 months will be served concurrently with his E.D. Va. sentence. Manafort's total prison time will be 90 months. ^ 30 months will be served concurrently with his D.D.C. sentence. Manafort's total prison time will be 90 months. ^ His sentence will be served concurrently with his 3-year sentence for campaign finance, tax evasion, and other charges. On October 30, 2017, it was revealed that Trump campaign foreign policy advisor George Papadopoulos had pleaded guilty earlier in the month to making a false statement to FBI investigators, a felony. The guilty plea was part of a plea bargain in which he agreed to cooperate with the government and "provide information regarding any and all matters as to which the Government deems relevant." On December 30, 2017, The New York Times reported that Papadopoulos had in May 2016 disclosed to the Australian High Commissioner to the United Kingdom Alexander Downer in Kensington Wine Rooms, a London wine bar, that the Russians possessed a large trove of stolen Hillary Clinton emails that could potentially damage her presidential campaign. Australia officials initially did not convey this information to the American counterparts but did so after WikiLeaks and DCLeaks released stolen Democratic National Committee emails in June/July 2016, which American intelligence has concluded with "high confidence" originated from Russian hackers. The hacking, and the revelation that a member of the Trump campaign apparently had inside information about it, were driving factors that led the FBI in July 2016 to open an investigation into Russia's attempts to disrupt the election and whether any of President Trump's associates conspired. The Nunes memo confirmed that the Papadopolous matter triggered the investigation—and not the Steele dossier, which some Republicans had alleged to have been the trigger. Papadopoulos was recruited to the Trump campaign in early March 2016. In a court document filed as part of Papadopoulos's guilty plea, prosecutors asserted that later in March while traveling in Italy he met Joseph Mifsud, a London-based academic with contacts in the Russian Ministry of Foreign Affairs. Mifsud showed little interest in Papadopoulos until Mifsud learned Papadopoulos was a member of the Trump campaign. Several days later, Papadopoulos met in London with Mifsud and "Olga Polonskaya", a Russian national whom Papadopoulos initially but falsely believed was Vladimir Putin's niece. Papadopoulos then emailed his Trump campaign supervisor Sam Clovis about his meetings, which he said included the Russian Ambassador, and which had been about a "meeting between us and the Russian leadership to discuss U.S.-Russia ties under President Trump." Clovis was non-committal but replied "Great work." In subsequent days Papadopoulos worked with Mifsud and Polonskaya to arrange contacts between the Russian Ministry of Foreign Affairs and the Trump campaign. In late April 2016, Papadopoulos emailed an unnamed Trump campaign "Senior Policy Advisor," stating "The Russian government has an open invitation by Putin for Mr. Trump to meet him when he is ready." At about the same time, Mifsud told Papadopoulos that the Russian government had "dirt" on Hillary Clinton in the form of "thousands of emails," which Papadopoulos then shared with Alexander Downer in a London bar days later. Mifsud dropped from sight after his name appeared in published reports in October 2017 and has not been heard from through May 2018. Stephan Roh, a German national who is a close associate of Mifsud, asserts he was detained, questioned and surveilled by FBI agents after he arrived on a flight to New York in 2017. The BBC reported on March 21, 2018, that Roh and another man named Ivan Timofeev were also involved in Papadopoulos's efforts to contact Russian officials. For several weeks prior to his scheduled sentencing, his wife had been saying publicly that he might reconsider his guilty plea and its agreement to cooperate with prosecutors. On August 17, Mueller recommended to the judge that Papadopoulos be sentenced to up to 6 months in prison for lying to the FBI. The recommendation commented that "The defendant's crime was serious and caused damage to the government's investigation into Russian interference in the 2016 presidential election," adding that he did not provide "substantial assistance" to the prosecution, but instead withheld information. On August 29, his wife said he has decided to stick with his plea agreement. On September 7, 2018, Papadopoulos was sentenced to 14 days in jail, plus 200 hours of community service, one year of probation and a $9,500 fine. He began serving his 14-day sentence on November 26, 2018, at FCI Oxford in Oxford, Wisconsin, and was released 12 days later on December 7, 2018. The two criminal trials of Paul Manafort are the first cases brought to trial by the special counsel's investigation into Russian interference in the 2016 presidential election. Manafort served as campaign chair for the Donald Trump 2016 presidential campaign from June 20 to August 19, 2016. In July 2017, the FBI conducted a raid of Manafort's home, authorized by search warrant under charges of interference in the 2016 election. Manafort and his business assistant Rick Gates were both indicted and arrested in October 2017 for charges of conspiracy against the United States, making false statements, money laundering, and failing to register as foreign agents for Ukraine. Gates entered a plea bargain in February 2018. Manafort's first trial on 18 criminal counts began on July 31, 2018. In that trial, Gates testified that he committed tax-evasion and embezzlement crimes with Manafort. Under cross examination, Gates also admitted to an extramarital relationship funded with money embezzled from Manafort. Manafort was found guilty on eight counts (covering filing false tax returns, bank fraud, and failing to disclose a foreign bank account), but a mistrial was declared on the remaining 10 counts due to a single juror harboring reasonable doubts. During his second trial, Manafort pleaded guilty to two counts: conspiracy to defraud the United States and witness tampering. He further admitted to the remaining charges against him, agreed to forfeit several properties and accounts, and agreed to full cooperation with the prosecution. Manafort has reportedly met with prosecutors nearly a dozen times. But in November 2018 it was reported that Manafort is not being as forthcoming as FBI investigators want and that they are "not getting what they want" from him. The reported breakdown in cooperation followed the firing of Jeff Sessions as attorney general and the appointment of Matthew Whittaker, a critic of the Mueller investigation, as acting attorney general. Mueller's office stated in a November 26, 2018, court filing that Manafort had repeatedly lied about a variety of matters, breaching the terms of his plea agreement. 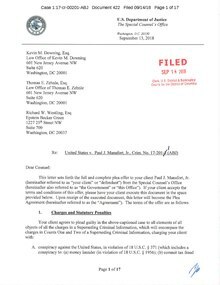 Manafort's attorneys disputed the assertion. Both sides agreed they were at an impasse and asked Judge Amy Berman Jackson to set a sentencing date for Manafort's trial convictions and guilty pleas. The New York Times reported on November 27, 2018, that Manafort attorney Kevin Downing continued sharing information about Manafort's legal matters with Trump's attorneys, pursuant to a joint defense agreement, for two months after Manafort had entered a plea and cooperation agreement with Mueller prosecutors. Although such joint defense agreements are not unusual or unlawful, they must be stopped if they create a conflict of interest, as it would be unethical for attorneys to collaborate when one of their clients is cooperating with prosecutors while another client is the subject of a continuing investigation. Legal experts noted that under joint defense privilege rules, once attorneys cease sharing a "common interest" of mutual defense, as in Manafort's case, attorney–client privilege is forfeited and the attorneys can be compelled to testify about what they discussed, opening the possibility of obstruction of justice or witness tampering. Attorneys for Michael Flynn had ended their joint defense agreement with Trump's attorneys when Flynn entered plea negotiations with Mueller. On March 7, 2019, Manafort was sentenced to 47 months in prison for the charges stemming from the trial held in the Eastern District of Virginia. As part of the investigation, Mueller assumed control of a Virginia-based grand jury criminal probe into the relationship between retired general Michael Flynn and Turkish businessman Kamil Ekim Alptekin. Flynn Intel Group, an intelligence consultancy, was paid $530,000 by Alptekin's company Inovo BV to produce a documentary and conduct research on Fethullah Gülen, an exiled Turkish cleric who lives in the United States. The special prosecutor is investigating whether the money came from the Turkish government, and whether Flynn kicked funds back to a middleman to conceal the payment's original source. Investigators are also looking at Flynn's finances more generally, including possible payments from Russian companies and from the Japanese government. White House documents relating to Flynn have been requested as evidence. The lead person within Mueller's team for this investigation is Brandon Van Grack. Flynn's son, Michael G. Flynn, is also a subject of the investigation. He worked closely with his father's lobbying company, the Flynn Intel Group, and accompanied his father on his 2015 visit to Moscow. On November 5, 2017, NBC News reported that Mueller had enough evidence for charges against Flynn and his son. NBC News reported on November 22, 2017, that former Flynn business partner Bijan Kian is a subject of the Mueller investigation. In late November 2017, Flynn's defense team stopped sharing information with Trump's team of lawyers, which was interpreted as a sign that Flynn was cooperating and negotiating a plea bargain with the special counsel team. On December 1, 2017, Michael Flynn agreed to a plea bargain with Mueller. He appeared in federal court to plead guilty to a single felony count of "willfully and knowingly" making "false, fictitious and fraudulent statements" to the FBI and to confirm his intention to cooperate with Mueller's investigation, including "participating in covert law enforcement activities." As part of Flynn's plea bargain, his son Michael G. Flynn is not expected to be charged. On January 31, 2018, the Mueller team advised a federal court that they will not be ready to request sentencing of Flynn until at least May 1, 2018; and on that day, the special counsel requested an extension to June 29, 2018. On that date, Mueller requested another extension, to August 24, 2018. Another postponement was requested on August 21, 2018, to September 17. On that date, the Mueller and Flynn legal teams requested Flynn be sentenced in late November 2018. In a sentencing memorandum released on December 4, 2018, the Mueller investigation stated Flynn "deserves credit for accepting responsibility in a timely fashion and substantially assisting the government" and should receive little or no jail time. Flynn's attorneys submitted a sentencing memo on December 11, 2018, requesting leniency and suggesting FBI agents had tricked him into lying during a White House interview on January 24, 2017, and did not advise him that lying to federal agents is a felony. The memo also asserted that Flynn's relaxed behavior during the interview indicated he was being truthful. Trump echoed this assertion two days later on Twitter and Fox News, asserting, "They convinced him he did lie, and he made some kind of a deal." Mueller's office rejected these assertions the next day, stating agents had told Flynn portions of what he had discussed with Russian ambassador Sergei Kislyak to jog his memory, but Flynn did not waver from his false statements. FBI agents concluded that Flynn's relaxed behavior during the interview was actually because he was fully committed to his lies and therefore could be compromised by the Kremlin. Mueller's office also documented instances when Flynn lied about the Kislyak conversation during the days before the FBI interview. Presiding judge Emmet Sullivan ordered documents related to the interview be provided to him prior to Flynn's December 18 sentencing, and could ask Flynn why he chose to raise this issue so late into his prosecution, after Mueller's office had recommended he receive little or no jail time. The New York Times reported that Flynn's "decision to attack the FBI in his own plea for probation appeared to be a gambit for a pardon from Mr. Trump, whose former lawyer had broached the prospect last year with a lawyer for Mr. Flynn." At Flynn's scheduled sentencing on December 18, Sullivan sharply rebuked him, stating, "I cannot assure that if you proceed today you will not receive a sentence of incarceration," offering to delay the sentencing until Flynn's cooperation with investigators was complete. After conferring with his attorneys, Flynn accepted the offer. During the hearing, Sullivan indicated he was offended by the suggestion in the sentencing memo submitted by Flynn's attorneys that the FBI had misled Flynn, as it created an appearance that Flynn wanted to both accept a generous plea deal from prosecutors while also contending he had been entrapped. Sullivan asked several questions of Flynn's attorney, Robert Kelner, to determine if the defense was maintaining that the FBI had acted improperly in its investigation of Flynn, including whether he had been entrapped. Kelner responded, "No, your honor" to each question. Flynn acknowledged to Sullivan that he was aware that lying to federal investigators was a crime at the time of his initial FBI interview in January 2017. On February 16, 2018, Mueller's office unsealed an indictment which revealed that Richard “Ricky” Pinedo Jr., of Santa Paula, California, accepted a plea agreement on February 2, in which he pleaded guilty to identity fraud, and using the identity of other persons for "unlawful activity", both felonies. Pinedo also agreed to cooperate with the investigation, but faces up to fifteen years in federal prison and a fine of $250,000. Pinedo had operated Auction Essistance, a web-based business that brokered bank account numbers, enabling people who had been barred from websites like eBay and PayPal to return to those websites under a different identity. He does not have a prior criminal history. On October 10, 2018, Pinedo was sentenced by United States District Judge Dabney L. Friedrich to six months in prison, followed by six months of home confinement. Pinedo is scheduled to be released from prison in May 2019. On February 16, 2018, Mueller charged attorney Alex van der Zwaan with one count of making false statements to the FBI with respect to van der Zwaan's communications with Gates and another individual identified as "Person A", believed to be Konstantin Kilimnik, in addition to deleting email sought by investigators. Van der Zwaan has worked with Manafort and Gates in 2012 on Ukraine-related matters. Van der Zwaan is the son-in-law of German Khan, who owns Russia's Alfa-Bank along with Mikhail Fridman and Petr Aven; all three of them are named in the Trump–Russia dossier. Van der Zwaan pleaded guilty on February 20, 2018; the guilty plea did not include an agreement to cooperate with the Mueller investigation. On March 27, 2018, Mueller's office asked a judge to consider jail time for van der Zwaan. His sentencing hearing was held on April 3, 2018, and he was sentenced to 30 days in prison followed by two months of supervised release, and fined $20,000. Judge Amy Berman Jackson stated that van der Zwaan, whose pregnant wife is due to give birth in August, can have his passport back after his 30-day sentence, at which point he can self-deport back to Europe if Immigrations and Customs Enforcement allows. Van der Zwaan was released from prison on June 4 to ICE custody and was deported the next day. Internet Research Agency, et al. Deputy Attorney General Rod Rosenstein announces indictments of 13 Russian individuals and three Russian companies. On February 16, 2018, special counsel Robert Mueller's team announced it had filed an indictment of 13 Russian nationals and three Russian organizations. The indictment alleges that Yevgeny Prigozhin, a businessman with close ties to Russian President Vladimir Putin, funneled significant funds to Internet Research Agency, a Kremlin-linked company headquartered in Saint Petersburg and described as a "troll factory", for the purposes of carrying out a secret operation to influence the outcome of the 2016 United States presidential election while obstructing the enforcement of federal elections laws. The indictment alleges that members of the conspiracy travelled to the United States to conduct research; created social media accounts impersonating Americans; opened financial accounts with the stolen identities of Americans; bought advertisements on social media platforms; organized and financed political rallies; and posted and promoted material favorable to Donald Trump, Jill Stein, and Bernie Sanders, while disparaging candidates like Hillary Clinton, Marco Rubio, and Ted Cruz. The indictment cites one case in which the defendants and their co-conspirators paid a U.S. person to build a cage on a flatbed truck and paid another U.S. person to wear a costume portraying Hillary Clinton in a prison uniform for a pro-Trump political rally in Florida. Reporters have since contacted some of those "unwitting" Americans. The man who built the cage says he often spoke on the phone with the group that paid him for it, and he never suspected he was dealing with Russians until the FBI contacted him months later. The indictment's allegations that Russians were actively interfering in the 2016 election process contradict President Trump's repeated assertions that Russian interference was a "hoax" devised by Democrats or perpetrated by others, such as China. Historically, Russia is second only to the United States in foreign election intervention and is therefore statistically the most probable perpetrator against the United States. A long-time associate of Paul Manafort, Konstantin Kilimnik was charged on June 8, 2018, on two counts, both relating to obstruction of justice. A Russian national, he is believed to be in Moscow, where he may have ties to Russian intelligence. The New York Times reported on August 31, 2018, that an unnamed Russian political operative and a Ukrainian businessman had illegally purchased four tickets to the inauguration of Donald Trump on behalf of Kilimnik. The tickets, valued at $50,000, were purchased with funds that had flowed through a Cypriot bank account. The transaction was facilitated by Sam Patten, an American lobbyist who had related work with Paul Manafort and pleaded guilty to failing to register as a foreign agent. Patten agreed to cooperate with Mueller's office and other law enforcement authorities. Deputy Attorney General Rod Rosenstein announces indictments of 12 Russian individuals. On July 13, 2018, Rod Rosenstein, the United States Deputy Attorney General, announced indictments of twelve Russian GRU officers for their efforts in the 2016 Democratic National Committee email leak, through the establishment of false identities as DCLeaks and Guccifer 2.0, as well as charges of money laundering using bitcoin. The indictment also alleged that an unnamed congressional candidate requested and received stolen documents about his/her opponent from Guccifer 2.0, and that the Russians were in contact with a "friendly reporter". Combined with the findings of the intelligence community in January 2017, and endorsed by the Senate Intelligence Committee in July 2018, the indictments appeared to decisively debunk a number of alternate theories by Trump and his allies about who perpetrated the hacks, and came three days before Trump was to meet with Russian president Vladimir Putin for a summit in Helsinki, Finland. After the indictments were announced, White House spokeswoman Lindsay Walters stated "Today's charges include...no allegations that the alleged hacking affected the election result." However, that the emails were stolen by hacking has never been in dispute, except for a debunked smear campaign promoted by numerous Trump allies that the emails were stolen and released by DNC employee Seth Rich, who supposedly was later "assassinated" in retribution. Bloomberg News reported that Trump permitted the indictments to be announced prior to the 2018 Russia–United States summit hoping it would strengthen his position in negotiations with Vladimir Putin. Former Trump attorney Michael Cohen pleaded guilty on November 29, 2018, to lying to the Senate Intelligence Committee in September 2017 regarding matters relating to the proposed development of a Trump Tower Moscow. On January 25, 2019, Roger Stone was arrested by the FBI and charged with seven counts, including witness tampering and lying to investigators. Before the charges brought by the Special Counsel were filed, Michael Cohen had pleaded guilty on August 21, 2018, in the United States District Court for the Southern District of New York, to five counts of tax evasion, one count of bank fraud and two counts related to campaign finance law violations. Cohen says he paid Stormy Daniels "at the direction of" Donald Trump for the purpose of "influencing the election". The Cohen investigation was referred to the New York investigators by the Special Counsel's Office. On August 31, 2018, Sam Patten, a Republican lobbyist, pleaded guilty to violating FARA in his unregistered work for a Ukrainian politician and a Ukrainian oligarch — and agreed to cooperate with the government. On April 12, 2019 Patten was sentenced to three years' probation, 500 hours of community service and a $5000 fine. Gregory Craig, former White House counsel for President Barack Obama, was indicted on April 11, 2019, on two counts of lying to federal investigators — including Special Counsel Robert Mueller's team — in connection with his work, at the law firm Skadden, on behalf of Russia-backed former President of Ukraine Viktor Yanukovych. He was arraigned the next day, and pleaded not guilty in the United States District Court for the District of Columbia. ^ Chappell, Bill (October 30, 2017). "Former Trump Adviser Admits To Seeking 'Dirt' On Clinton From Russians, Lying To FBI". NPR. Archived from the original on December 4, 2017. Retrieved December 2, 2017. ^ "Former Trump adviser George Papadopoulos gets 14 days in jail". Washington Examiner. Archived from the original on September 8, 2018. Retrieved September 7, 2018. ^ a b "Ex-Trump campaign adviser Papadopoulos reports to prison". Washington Post. ^ a b "George Papadopoulos released from prison two days early". Fox News. ^ a b "United States v. Manafort (case no. 1:17-cr-201-ABJ) Indictment" (PDF). United States District Court for the District of Columbia. October 30, 2017. Archived from the original on November 26, 2017. Retrieved December 2, 2017. ^ Breuninger, Kevin (February 23, 2018). "Former Trump campaign official Rick Gates pleads guilty to lying and conspiracy against the US". CNBC. Archived from the original on February 24, 2018. Retrieved February 23, 2018. ^ "United States v. Gates (case no. 1:17-cr-201-2-ABJ) Superseding Criminal Information" (PDF). United States District Court for the District of Columbia. February 23, 2018. Archived from the original on February 24, 2018. Retrieved February 24, 2018. ^ Weiner, Rachel (February 27, 2018). "Special counsel moves to drop tax, bank fraud charges against Rick Gates". The Washington Post. Archived from the original on July 14, 2018. Retrieved July 16, 2018. ^ a b "United States v. Manafort (case no. 1:18-cr-83-TSE) Superseding Indictment" (PDF). United States District Court for the Eastern District of Virginia. February 22, 2018. Archived from the original on February 22, 2018. Retrieved February 22, 2018. ^ "United States v. Manafort (case no. 1:17-cr-201) Superseding Indictment" (PDF). United States District Court for the District of Columbia. February 23, 2018. Archived from the original on February 23, 2018. Retrieved February 24, 2018. ^ a b "United States v. Manafort (case no. 1:17-cr-201) Superseding Indictment" (PDF). United States District Court for the District of Columbia. June 8, 2018. Archived from the original on June 8, 2018. Retrieved June 8, 2018. ^ Winter, Tom; Edelman, Adam; Dilanian, Ken (September 14, 2018). "Paul Manafort pleads guilty in Mueller probe, will cooperate with prosecutors". CNN. Archived from the original on October 14, 2018. Retrieved September 14, 2018. ^ "United States v. Manafort (case no. 1:17-cr-201) Superseding Criminal Information" (PDF). United States District Court for the District of Columbia. September 14, 2018. Archived from the original on September 14, 2018. Retrieved September 14, 2018. ^ Polantz, Katelyn; Berman, Dan; Cohen, Marshall; Stark, Liz (August 21, 2018). "Paul Manafort found guilty on eight counts". CNN. Archived from the original on August 31, 2018. Retrieved August 21, 2018. ^ LaFraniere, Sharon (2019-03-07). "Paul Manafort Is Sentenced to Less Than 4 Years in 1 of 2 Cases Against Him". The New York Times. ISSN 0362-4331. Retrieved 2019-03-08. ^ Leonnig, Carol D.; Entous, Adam; Barrett, Devlin; Zapotosky, Matt (December 1, 2017). "Michael Flynn pleads guilty to lying to FBI on contacts with Russian ambassador". The Washington Post. Archived from the original on December 1, 2017. Retrieved December 2, 2017. ^ "United States v. Flynn (case no. 1:17-cr-232-RC) Information" (PDF). United States District Court for the District of Columbia. November 30, 2017. Archived from the original on December 1, 2017. Retrieved December 2, 2017. ^ a b c d Kutner, Max (February 16, 2018). "Who is Richard Pinedo, the latest guilty plea in the Mueller investigation?". Newsweek. Archived from the original on February 16, 2018. Retrieved February 16, 2018. ^ Adiel Kaplan. "Richard Pinedo becomes third person sentenced in Mueller probe". NBC News. Archived from the original on October 17, 2018. Retrieved October 14, 2018. ^ "United States v. Pinedo (case 1:18-cr-24-DLF) Information" (PDF). United States District Court for the District of Columbia. February 12, 2018. Archived from the original on February 16, 2018. Retrieved February 16, 2018. ^ a b Jacobs, Ben (April 3, 2018). "Lawyer Alex van der Zwaan jailed for 30 days in Mueller's first conviction". The Guardian. Archived from the original on April 3, 2018. Retrieved April 3, 2018. ^ a b Polantz, Katelyn (June 5, 2018). "Alex van der Zwaan, only person to serve time in Mueller investigation, deported". CNN. Archived from the original on June 5, 2018. Retrieved June 5, 2018. ^ a b Murdock, Jeff (June 5, 2018). "Alexander van der Zwaan, Dutch lawyer indicted by Mueller, deported". The Washington Times. Archived from the original on June 6, 2018. Retrieved June 5, 2018. ^ a b "United States v. Alex Van Der Zwaan (case 1:18-cr-31) Information" (PDF). United States District Court for the District of Columbia. February 16, 2018. Archived from the original on February 20, 2018. Retrieved February 20, 2018. ^ Lynch, Sarah N. (May 10, 2018). "Russian firm tied to 'Putin's cook' pleads not guilty in U.S." Reuters. Archived from the original on May 10, 2018. Retrieved May 10, 2018. ^ "U.S. v. Viktor Borisovich Netyksho (case 1:18-cr-215) Indictment" (PDF). United States District Court for the District of Columbia. July 13, 2018. Archived from the original on September 3, 2018. Retrieved July 13, 2018. ^ Helderman, Rosalind S. (2018-11-29). "Michael Cohen, Trump's former lawyer, pleads guilty to lying to Congress". The Washington Post. Retrieved 2018-11-29. ^ "U.S. v. Michael Cohen (case no. 1:18-cr-850) Information" (PDF). United States District Court for the Southern District of New York. November 29, 2018. Archived from the original on November 29, 2018. Retrieved November 29, 2018. ^ "United States v. Roger Jason Stone, Jr. (case no. 1:19-cr-18) Indictment" (PDF). United States District Court for the District of Columbia. 2019-01-24. Retrieved 2019-01-25. ^ Bump, Phillip (October 30, 2017). "Paul Manafort: A FAQ about Trump's indicted former campaign chairman". The Washington Post. Archived from the original on November 9, 2017. Retrieved October 30, 2017. ^ "Ex-Trump Adviser George Papadopoulos Pleads Guilty in Mueller's Russia Probe". NBC News. October 30, 2017. Archived from the original on May 18, 2018. Retrieved October 30, 2017. ^ "Background to "Assessing Russian Activities and Intentions in Recent US Elections": The Analytic Process and Cyber Incident Attribution" (PDF). Director of National Intelligence. Archived (PDF) from the original on June 26, 2017. Retrieved February 27, 2018. ^ LaFraniere, Sharon; Mazzetti, Mark; Apuzzo, Matt (December 30, 2017). "How the Russia Inquiry Began: A Campaign Aide, Drinks and Talk of Political Dirt". The New York Times. ISSN 0362-4331. Archived from the original on December 30, 2017. Retrieved December 30, 2017. ^ Weaver, Dustin (February 2, 2018). "Memo: Papadopoulos info triggered FBI's Russia investigation". The Hill. Archived from the original on February 27, 2018. Retrieved February 27, 2018. ^ "How the Russia Inquiry Began: A Campaign Aide, Drinks and Talk of Political Dirt". The New York Times. December 30, 2017. Archived from the original on December 30, 2017. Retrieved May 15, 2018. ^ Helderman, Rosalind S. (November 2, 2017). "Who's who in the George Papadopoulos court documents". The Washington Post. Archived from the original on May 29, 2018. Retrieved May 15, 2018. ^ Kelly, Meg (November 13, 2017). "Analysis – All the known times the Trump campaign met with Russians". The Washington Post. Archived from the original on May 4, 2018. Retrieved May 15, 2018. ^ "The Mysterious Professor At The Center Of The Russia-Trump Probe Has Disappeared. Even His Girlfriend Can't Find Him". Buzzfeed. Archived from the original on April 30, 2018. Retrieved May 15, 2018. ^ Risen, James (April 12, 2018). "The Absent Professor: A Key Trump–Russia Intermediary Has Been Missing for Months, as the Case for Collusion Grows Stronger". The Intercept. Archived from the original on May 15, 2018. Retrieved May 15, 2018. ^ Bertrand, Natasha. "Mueller's Probe Is Even More Expansive Than It Seems". The Atlantic. Archived from the original on May 14, 2018. Retrieved May 15, 2018. ^ "Why a Zurich lawyer is being targeted in Russiagate". The Local. May 14, 2018. Archived from the original on May 14, 2018. Retrieved May 15, 2018. ^ Sweeney, John; Bowen, Innes (March 21, 2018). "The mystery professor behind Trump Russia inquiry". BBC News. Archived from the original on May 15, 2018. Retrieved May 15, 2018. ^ a b Mosk, Matthew; Bruggeman, Lucien (August 29, 2018). "After weeks of uncertainty, Papadopoulos decides to accept plea deal with Mueller". ABC News. Archived from the original on September 5, 2018. Retrieved August 31, 2018. ^ "U.S. special counsel recommends six months in prison for Papadopoulos". Reuters. August 17, 2018. Archived from the original on September 5, 2018. Retrieved August 31, 2018. ^ "George Papadopoulos, Trump Campaign Adviser, Is Sentenced to 14 Days in Jail". The New York Times. Archived from the original on September 7, 2018. Retrieved September 7, 2018. ^ McCaskill, Nolan (August 19, 2016). "Paul Manafort resigns from Trump campaign". Politico. Archived from the original on August 19, 2016. Retrieved August 19, 2016. ^ Emily Flitter and Emily Stephenson (June 21, 2016). "Trump fires campaign manager in shakeup for election push". Reuters. Archived from the original on August 2, 2016. Retrieved August 2, 2016. ^ Leonnig, Carol D.; Hamburger, Tom; Helderman, Rosalind S. "FBI conducted raid of former Trump campaign chairman Manafort's home". The Washington Post. Archived from the original on August 9, 2017. Retrieved June 29, 2018. ^ Diaz, Daniella; Perez, Evan (August 10, 2017). "FBI raided Manafort home as part of Russia probe". CNN. Archived from the original on August 9, 2017. Retrieved August 10, 2017. ^ Mazzetti, Mark; Haberman, Maggie (February 23, 2018). "Rick Gates, Trump Campaign Aide, Pleads Guilty in Mueller Inquiry and Will Cooperate". The New York Times. Archived from the original on February 23, 2018. Retrieved February 24, 2018. ^ Barrett, Devlin; Hsu, Spencer S. (February 23, 2018). "Former Trump campaign official Rick Gates pleads guilty to 2 charges". The Washington Post. Archived from the original on February 24, 2018. Retrieved February 24, 2018. ^ Day, Chad (August 9, 2018). "Gates admits crimes with - and embezzlement from - Manafort". Associated Press. Archived from the original on August 8, 2018. Retrieved August 15, 2018. ^ "Rick Gates, testifying in Manafort trial, admits to affair, London apartment". NBC News. August 7, 2018. Archived from the original on August 16, 2018. Retrieved August 15, 2018. ^ Zapotosky, Matt (August 23, 2018). "Lone holdout on Manafort jury blocked conviction on all 18 counts, juror says". The Washington Post. Retrieved August 23, 2018. ^ "Paul Manafort has agreed to cooperate with Robert Mueller". Vox. Vox. Archived from the original on September 14, 2018. Retrieved September 14, 2018. ^ "Manafort will cooperate with Mueller as part of guilty plea, prosecutor says". Washington Post. Archived from the original on October 12, 2018. Retrieved September 14, 2018. ^ March, Mary Tyler (September 14, 2018). "READ: Manafort's cooperation agreement with Mueller". TheHill. Archived from the original on September 15, 2018. Retrieved September 14, 2018. ^ Polantz, Katelyn. "Paul Manafort pleads guilty and agrees to cooperate with Mueller investigation". CNN. Archived from the original on September 29, 2018. Retrieved September 15, 2018. ^ "Manafort forfeits $22 million in New York real estate in plea deal". NBC News. September 15, 2018. Archived from the original on October 16, 2018. Retrieved September 16, 2018. ^ "Tensions rising between Mueller, Manafort over level of cooperation: Sources". November 9, 2018. Archived from the original on November 13, 2018. Retrieved November 12, 2018. ^ Sheth, Sonam (November 11, 2018). "Paul Manafort is reportedly hitting the brakes on cooperating with Mueller". San Francisco Chronicle. Business Insider. Archived from the original on November 13, 2018. Retrieved November 12, 2018. ^ "Manafort Breached Plea Deal by Repeatedly Lying, Mueller Says". The New York Times. Archived from the original on November 27, 2018. Retrieved November 27, 2018. ^ "Manafort's Lawyer Said to Brief Trump Attorneys on What He Told Mueller". The New York Times. Archived from the original on November 28, 2018. Retrieved November 28, 2018. ^ "Experts: Trump, Manafort lawyers sharing info could be obstruction". NBC News. Retrieved November 28, 2018. ^ "How Rudy Giuliani's Latest Blabbermouth Session May Have Turned Him into a Witness to Obstruction". lawandcrime.com. Retrieved November 28, 2018. ^ "A Split From Trump Indicates That Flynn Is Moving to Cooperate With Mueller". The New York Times. Archived from the original on November 23, 2017. Retrieved November 28, 2018. ^ "Paul Manafort: Ex-Trump campaign chief jailed for fraud". BBC. 2019-03-08. Retrieved 2019-03-08. ^ a b Layne, Nathan; Hosenball, Mark; Ainsley, Julia Edwards (June 2, 2017). Krolicki, Kevin; Colvin, Ross (eds.). "Exclusive: Special counsel Mueller to probe ex-Trump aide Flynn's Turkey ties". Reuters. Archived from the original on July 2, 2017. Robert Mueller, the special counsel investigating possible ties between the Trump election campaign and Russia, is expanding his probe to assume control of a grand jury investigation into former national security adviser Michael Flynn, three sources told Reuters [...] Federal prosecutors in Virginia are investigating a deal between Flynn and Turkish businessman Ekim Alptekin as part of a grand jury criminal probe, according to a subpoena seen by Reuters. ^ Apuzzo, Matt; Schmidt, Michael S.; Rosenberg, Matthew (August 4, 2017). "Mueller Seeks White House Documents on Flynn". The New York Times. Archived from the original on August 5, 2017. Retrieved August 5, 2017. ^ Apuzzo, Matt (August 3, 2017). "Mueller Issuing Subpoenas Through Washington Grand Jury". The New York Times. ISSN 0362-4331. Archived from the original on August 4, 2017. Retrieved August 4, 2017. ^ Lee, Carol E.; Ainsley, Julia; Dilanian, Ken (September 13, 2017). "Mike Flynn's son is subject of federal Russia investigation". NBC News. Archived from the original on September 14, 2017. Retrieved September 15, 2017. ^ "Mueller has enough evidence to bring charges in Flynn investigation". NBC News. Archived from the original on November 24, 2017. Retrieved November 5, 2017. ^ "Mueller eyes Mike Flynn business partner Bijan Kian". NBC News. Archived from the original on November 23, 2017. Retrieved March 24, 2018. ^ a b Schmidt, Michael S.; Apuzzo, Matt; Haberman, Maggie (November 23, 2017). "A Split From Trump Indicates That Flynn Is Moving to Cooperate With Mueller". The New York Times. Archived from the original on November 23, 2017. ^ Kenny, Caroline (November 26, 2017). "Bharara: 'Substantial likelihood' Flynn lawyers are in discussions on cooperating in Mueller probe". CNN. Archived from the original on November 27, 2017. ^ Mosk, Matthew; Levine, Mike; Ross, Brian (November 27, 2017). "Flynn's lawyer meets members of special counsel's team, raising specter of plea deal". ABC News. ^ Herb, Jeremy (December 1, 2017). "Flynn charged with one count of making false statement". CNN. Archived from the original on October 8, 2018. Retrieved December 1, 2017. ^ "Case 1:17-cr-00232-RC Document 3". United States Department of Justice. December 1, 2017. Archived from the original on April 13, 2018. Retrieved April 12, 2018. ^ Singman, Brooke (February 1, 2018). "Mueller team seeks delay in Flynn sentencing". Fox News. Archived from the original on May 1, 2018. Retrieved May 1, 2018. ^ Polantz, Katelyn. "Mueller asks for 2 more months before Flynn sentencing". CNN. Archived from the original on May 1, 2018. Retrieved May 1, 2018. ^ Press, Associated. "Mueller: Flynn not ready to be sentenced yet in Russia probe". Chicago Tribune. Retrieved June 29, 2018. ^ Keller, Megan (August 21, 2018). "Flynn sentencing hearing delayed". Archived from the original on August 21, 2018. Retrieved August 21, 2018. ^ Polantz, Katelyn. "Michael Flynn set to be sentenced after midterms". CNN. Archived from the original on September 18, 2018. Retrieved September 18, 2018. ^ Goldman, Adam; Sullivan, Eileen (December 4, 2018). "Flynn Was a Key Cooperator and Deserves Little Prison Time, Mueller Team Says". Retrieved December 5, 2018 – via NYTimes.com. ^ Goldman, Adam (December 11, 2018). "Michael Flynn Asks Judge for Leniency for Lying to F.B.I." Retrieved December 15, 2018 – via NYTimes.com. ^ Goldman, Adam (December 14, 2018). "Mueller Rejects Flynn's Attempt to Portray Himself as Victim of the F.B.I." Retrieved December 15, 2018 – via NYTimes.com. ^ LaFraniere, Sharon; Goldman, Adam (December 18, 2018). "Trump Wishes Michael Flynn Good Luck Before Sentencing". Retrieved December 18, 2018 – via NYTimes.com. ^ Kirchgaessner, Stephanie (December 18, 2018). "'I can't hide my disgust, my disdain': judge lambasts Michael Flynn". Retrieved December 18, 2018 – via www.theguardian.com. ^ "'I'm not hiding my disgust, my disdain': Veteran judge upends hopes of Trump allies as he spotlights Flynn's misdeeds". Washington Post. ^ "Flynn: "I was aware" that lying to FBI investigators was a crime". www.cnn.com. December 18, 2018. Retrieved December 19, 2018. ^ a b "Santa Paula man in 'state of fear' after aiding Mueller probe". Ventura County Star. September 26, 2018. Archived from the original on 2018-09-28. Retrieved September 27, 2018. ^ Lessem, Jeremy I. (September 26, 2018). "Case 1:18-cr-00024-DLF Document 25" (PDF). United States District Court for the District of Columbia. pp. 3–4. Mr. Pinedo's enterprise essentially entailed providing “customers” of Auction Essistance with bank account and deposit information so that they could establish verified Pay Pal accounts without the need of providing personal bank account information. ^ Johnson, Kevin (October 10, 2018). "Santa Paula man sentenced for providing Russians access to fraudulent bank accounts". Ventura County Star. USA TODAY. Archived from the original on 2018-10-11. Retrieved October 11, 2018. ^ Tillman, Zoe (October 10, 2018). "A Man Charged In Connection With Mueller's Russian Troll Farm Case Was Sentenced To Six Months In Prison". BuzzFeed News. Archived from the original on October 11, 2018. Retrieved October 10, 2018. ^ Cohen, Marshall (December 12, 2018). "The 4 people sentenced to prison so far in Mueller's investigation". CNN. Retrieved 2019-03-08. ^ Polantz, Katelyn; Cohen, Marshall (February 20, 2018). "Mueller charges lawyer with lying about interaction with Rick Gates". CNN. Archived from the original on June 12, 2018. Retrieved February 20, 2018. ^ a b c Dilanian, Ken; Williams, Pete; Winter, Tom; Connor, Tracy (February 20, 2018). "Mueller files charge against lawyer whose father-in-law is oligarch". NBC News. Archived from the original on June 14, 2018. Retrieved July 7, 2018. ^ Voreacos, David (February 20, 2018). "Mueller Charges Lawyer With Lying in Russia Probe". Bloomberg. Archived from the original on February 20, 2018. Retrieved February 20, 2018. ^ Day, Chad; Tucker, Eric (February 20, 2018). "Attorney admits he lied to Mueller's federal agents". Associated Press. Archived from the original on February 20, 2018. Retrieved February 20, 2018. ^ "Mueller Gets Plea, No Cooperation, as Skadden Lawyer Admits Lies". Bloomberg LP. February 20, 2018. Archived from the original on February 21, 2018. Retrieved February 22, 2018. ^ Tillman, Zoe (March 27, 2018). "Robert Mueller's Office Wants A Judge To Consider Jail Time For A Lawyer Who Pleaded Guilty To Lying". BuzzFeed News. Archived from the original on March 29, 2018. Retrieved March 29, 2018. ^ Voreacos, David; Larson, Erik (April 3, 2018). "Lawyer Who Lied to Mueller About Russian Spy Gets 30 Days". Bloomberg Politics. Archived from the original on April 3, 2018. Retrieved April 3, 2018. ^ Turner, Trish; Bruggeman, Lucien (April 3, 2018). "Dutch lawyer sentenced in Mueller probe". ABC News. Archived from the original on April 6, 2018. Retrieved April 7, 2018. ^ Milibank, Dana (April 3, 2018). "It's Mueller time". Washington Post. Retrieved April 7, 2018. ^ Polantz, Katelyn; Kopan, Tal (June 5, 2018). "Only person to serve time in Mueller investigation deported". CNN. Archived from the original on June 5, 2018. Retrieved June 5, 2018. ^ Re, Gregg (June 4, 2018). "Lawyer linked to Trump campaign who pleaded guilty in Russia probe released from prison, turned over to ICE". Fox News. Archived from the original on June 4, 2018. Retrieved June 5, 2018. ^ "Read: Mueller's indictment of Russians for interfering with US elections". Vox. Archived from the original on October 14, 2018. Retrieved February 23, 2018. ^ a b Mueller, Robert S. (February 16, 2018). "Case 1:18-cr-00032-DLF". United States Department of Justice. Archived from the original on March 23, 2018. Retrieved March 23, 2018. ^ MacFarquhar, Neil (February 16, 2018). "Meet Yevgeny Prigozhin, the Russian Oligarch Indicted in U.S. Election Interference". The New York Times. Archived from the original on February 16, 2018. Retrieved February 17, 2018. ^ Taylor, Adam (February 18, 2018). "The Russian journalist who helped uncover election interference is confounded by the Mueller indictments". The Washington Post. Archived from the original on February 22, 2018. Retrieved February 22, 2018. ^ a b Apuzzo, Matt; LaFraniere, Sharon (February 16, 2018). "13 Russians Indicted as Mueller Reveals Effort to Aid Trump Campaign". The New York Times. Archived from the original on February 17, 2018. Retrieved February 17, 2018. ^ "The unwitting: The Trump supporters used by Russia". CNN Money. CNN. February 20, 2018. Archived from the original on February 22, 2018. Retrieved February 22, 2018. ^ Landler, Mark; Shear, Michael D. (February 16, 2018). "Indictment Makes Trump's Hoax Claim Harder to Sell". The New York Times. Archived from the original on October 10, 2018. Retrieved February 17, 2018. ^ Klaas, Brian (February 17, 2018). "Opinion – Russia is at war with our democracy. When will we finally start defending it?". The Washington Post. Archived from the original on August 6, 2018. Retrieved February 17, 2018. ^ Shulman, Stephen; Bloom, Stephen (2012). "The legitimacy of foreign intervention in elections: the Ukrainian response". Review of International Studies. 38 (2): 445–471. Retrieved January 12, 2017. ^ Vogel, Kenneth (June 8, 2018). "Mueller Adds Obstruction Charge on Manafort and Indicts His Right-Hand Man". The New York Times. ISSN 0362-4331. Archived from the original on September 5, 2018. Retrieved June 8, 2018. ^ Wilber, Del Quentin; Viswanatha, Aruna (June 8, 2018). "Ex-Trump Campaign Chairman Paul Manafort Indicted on Obstruction Charges". Wall Street Journal. ISSN 0099-9660. Archived from the original on June 8, 2018. Retrieved June 8, 2018. ^ Barrett, Devlin; Hsu, Spencer S. (June 8, 2018). "Special counsel Mueller indicts Paul Manafort, Russian associate on obstruction charges". Washington Post. ISSN 0190-8286. Retrieved June 8, 2018. ^ "Lobbyist Pleads Guilty to Steering Foreign Funds to Trump Inaugural". The New York Times. Archived from the original on August 31, 2018. Retrieved August 31, 2018. ^ "Paul Manafort associate pleads guilty, agrees to cooperate with Mueller investigation". Archived from the original on August 31, 2018. Retrieved September 1, 2018. ^ Sullivan, Eileen; Benner, Katie (July 13, 2018). "12 Russian Intelligence Officers Indicted in Hacking Tied to the Clinton Campaign". The New York Times. Archived from the original on September 5, 2018. Retrieved July 13, 2018. ^ Wilkie, Christina (July 13, 2018). "5 key takeaways from the latest indictment in Mueller's Russia probe". CNBC. Archived from the original on July 13, 2018. Retrieved July 14, 2018. ^ Barrett, Devlin; Zapotosky, Matt (July 13, 2018). "Mueller probe indicts 12 Russians for hacking Democrats in 2016". The Washington Post. Archived from the original on July 13, 2018. Retrieved July 13, 2018. ^ Beckwith, Ryan Teague (July 13, 2018). "The Russian Hacking Indictments Laid Out Cold, Hard Facts Amid the Theatrics". TIME. Archived from the original on July 19, 2018. Retrieved July 13, 2018. ^ "Intelligence Report on Russian Hacking". The New York Times. Archived from the original on January 8, 2017. Retrieved July 13, 2018. ^ Herb, Jeremy. "Senate panel agrees with intel community that Putin was trying to help Trump". CNN. Archived from the original on July 11, 2018. Retrieved July 13, 2018. ^ Blake, Aaron (July 13, 2018). "Analysis - Rod Rosenstein and Robert Mueller officially repudiate a major Trump conspiracy theory". Washington Post. Archived from the original on July 13, 2018. Retrieved July 13, 2018. ^ Katelyn Polantz and Stephen Collinson. "12 Russians indicted in Mueller investigation". CNN. Archived from the original on July 14, 2018. Retrieved July 14, 2018. ^ "Fox's Newt Gingrich peddles disgraceful conspiracy theory that Seth Rich was "assassinated"". May 21, 2017. Archived from the original on July 13, 2018. Retrieved July 14, 2018. ^ "Fox's Newt Gingrich refuses to walk back claim that murdered DNC staffer was responsible for DNC email hacks even after 12 Russians were indicted". July 13, 2018. Archived from the original on July 14, 2018. Retrieved July 14, 2018. ^ "Trump Decided Russia Indictments Should Come Pre-Summit, Sources Say". Archived from the original on July 21, 2018. Retrieved July 21, 2018. ^ Mazzetti, Mark; Weiser, Benjamin; Protess, Ben; Haberman, Maggie (November 29, 2018). "Cohen Pleads Guilty and Details Trump's Involvement in Moscow Tower Project". The New York Times. Retrieved November 29, 2018. ^ Stephanopoulos, George; Larramendia, Eliana; Hill, James; Pearle, Lauren (November 29, 2018). "Michael Cohen pleads guilty to lying to Congress in new deal with Mueller in Trump-Russia probe". ABC News. Retrieved November 29, 2018. ^ "Michael Cohen Plea Agreement" (PDF). Special Counsel's Office, United States Department of Justice. November 29, 2018. Retrieved November 30, 2018 – via National Public Radio. ^ Mazzetti, Mark; Sullivan, Eileen; Haberman, Maggie (2019-01-25). "Indicting Roger Stone, Mueller Shows Link Between Trump Campaign and WikiLeaks". The New York Times. ISSN 0362-4331. Retrieved 2019-01-25. ^ Scannell, Kara; Prokupecz, Shimon; Jarrett, Laura; Orden, Erica (August 21, 2018). "Michael Cohen pleads guilty to eight criminal counts". CNN. Archived from the original on August 21, 2018. Retrieved August 21, 2018. ^ News, A. B. C. (August 31, 2018). "Manafort associate pleads guilty, agrees to cooperate with Mueller". ABC News. Archived from the original on October 21, 2018. Retrieved November 28, 2018. ^ "Lobbyist sentenced to probation for funneling money to Trump inaugural from foreign nationals". NBC News. ^ Vogel, Kenneth P.; Benner, Katie (2019-04-11). "Gregory Craig, Ex-Obama Aide, Is Indicted on Charges of Lying to Justice Dept". The New York Times. ISSN 0362-4331. Retrieved 2019-04-15. ^ Montague, Zach (2019-04-12). "Gregory Craig Pleads Not Guilty to Lying to Justice Dept". The New York Times. ISSN 0362-4331. Retrieved 2019-04-15.